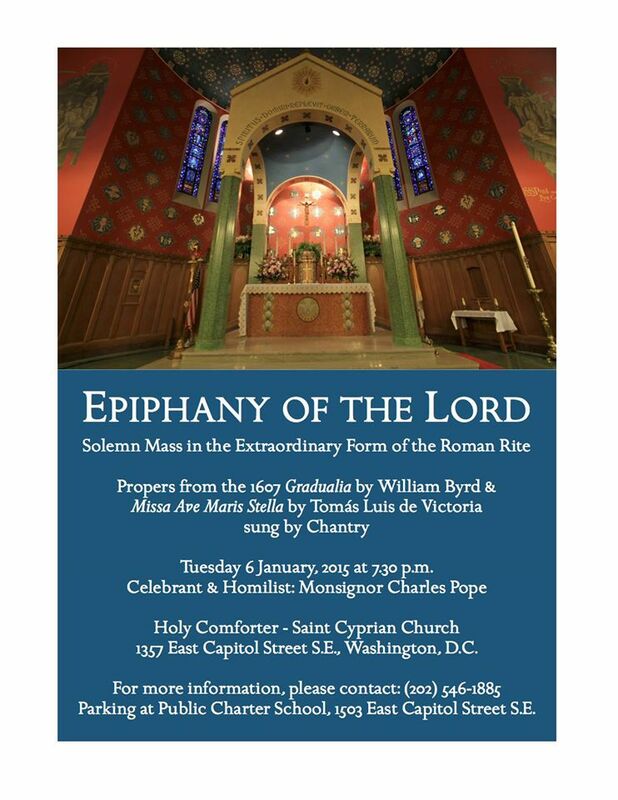 The venerable and powerful blessing of Epiphany Water will be done according to the Traditional Latin Rite at St. John the Beloved Church in McLean on Saturday evening, January 6, at 7:30 pm in the church. Those who wish to take home blessed Epiphany Water should bring a small empty container, worthy of and designated for this use. Those unable to attend may see the sacristan to obtain Epiphany Water. Blessed Epiphany Chalk for home use will also be available that weekend. St. John the Beloved Church is located at 6420 Linway Terrace, near the intersection of Old Dominion Drive and Birch Road in McLean. Ample free parking is available. The Georgetown Traditional Latin Mass (Extraordinary Form) Community announces that a Missa Cantata will be offered Friday, January 9, at 6:00 pm in Copley Crypt Chapel at Georgetown University. Father Stephen Fields, S.J., will be the celebrant of the ferial Mass of Epiphanytide. The Traditional Latin Mass (Extraordinary Form) will be offered at the following times on Monday morning, Tuesday evening, and Saturday morning of this week by Father Richard Carr at St. Michael Church, 7401 St. Michael’s Lane, Annandale.